Here's another reason to like Chris Dodd. 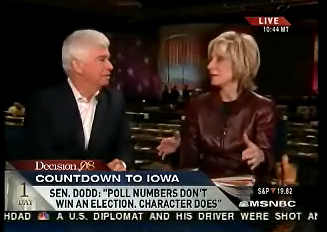 Andrea Mitchell wanted to know who Chris Dodd would support for the presidential nomination because she said there were reports that other candidates who are not considered to be in the top tier are cutting deals. He would have none of that talk and said it was irresponsible for any candidate to cut deals or endorse another candidate because his supporters are---you know---supporting him. She kept pressing the issue, but he didn't back down. It's nice to know he won't be auctioning off his supporters. 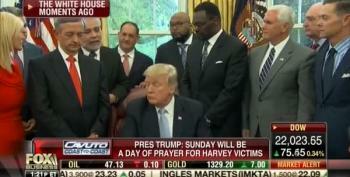 Dodd: Yea, I'm totally opposed to that and let me take advantage of the interview Andrea saying don't make any calls to my office, any campaigns...I didn't come here and spend a year campaigning in Iowa...working and expect the people who committed themselves to me at my behest and support someone else. They made a decision to be for me and I'm grateful to them.